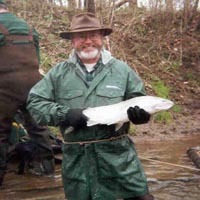 Paul M. (Michael) Stewart, Ph.D. Thank you for logging onto my webpage. I am a Professor in our Masters Program in Environmental Analysis and Management and in our undergraduate Environmental Science Program at Troy University. I am interested in providing information that will help to preserve biodiversity on the planet and will consider most groups of organisms to study. My research interests are primarily in ecological assesssment, rare and endangered species biology, and pollution biology, with the following projects currently or recently underway: Ecological requirements, distribution, and habitat partitioning of crayfish assemblages; Ecological status, life history, host preferences for candidate mussel species; Ecological assessment of watersheds and landscapes; and, Development of multi-metric indices for assessing regional aquatic conditions. Please browse my links above and discover the research and educational opportunities that await you at Troy University.